Over the years, Camp Caritas has used Native American themes to promote brotherhood, respect and sportsmanship amongst the campers. The Inukshuk, is a man-shaped stone monument that the Inuits erected in the northern lands to guide their people when they went on a journey. Visible from far, they indicated the right direction to follow. Wanuskewin is an indian word meaning Living in harmony. All the campers must learn to live in harmony with each other. With their cabin mates or with their team mates, they must all understand the true meaning of harmony. Wanuskewin is also the name of the center place where everybody meets before and after all the camp activities. 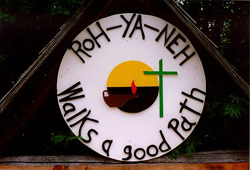 From a Mohawk word, Roh-Ya-Neh means "Walks a good path". Caritas wants all its campers to walk the right path in life by making the right choices. Caritas offers the perfect atmosphere to promote this theme in all the activities. From a Mohawk word, Guan Yesta means "Respect". Caritas wants its campers to understand why respect is so important in our lives today under all its forms: respect for nature and the environment, respect for each other and yourself.